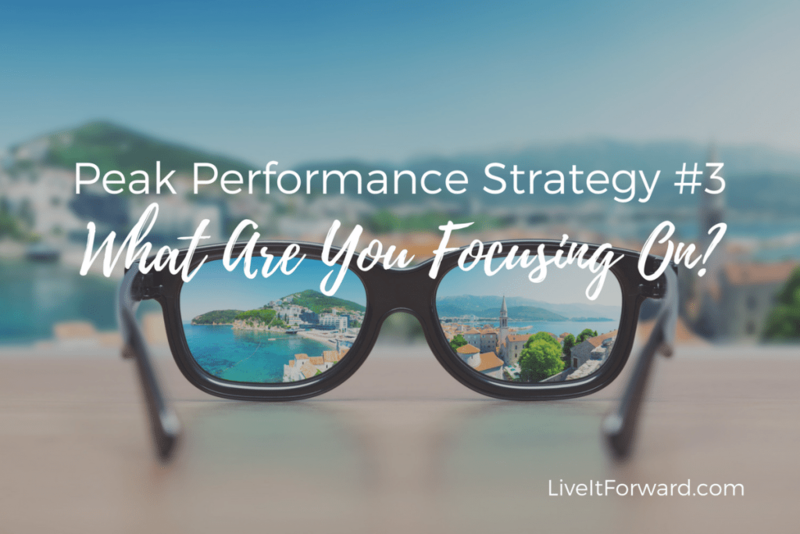 LIF 080 - Peak Performance Strategy #3 - What Are You Focusing On? Peak Performance Strategy #3 – What Are You Focusing On? What are you focusing on? Are you juggling a million things and hoping they don’t crash? In today’s podcast we are continuing our Peak Performance series and highlighting that what you choose to focus is key to peak performance. In episode 080 of The Live It Forward Show, you’ll discover tips to help you live at your peak performance. 2. Our newest series — Peak Performance Strategy. Peak Performance Strategy #2 — Where are you? Episode 080 — What Are You Focusing On? Episode 081 — How Do You Hit Your Peak? 3. What Are You Focusing On? Big Idea: What you CHOOSE to focus is key to peak performance. Peak performance doesn’t mean you focus just on the 1 Percent Action. It means you CHOOSE the best times to focus on the 1 Percent Actions, the best times focus on the 20 percent actions, and the best times to focus on the 80 percent actions.